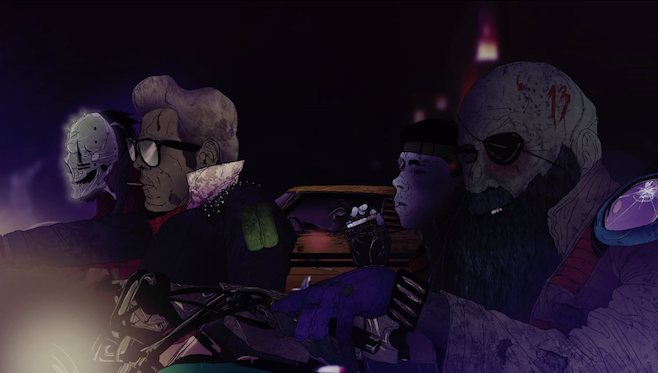 Queens of the Stone Age are on a roll with the new video clips this month, and next up is the video for “If I Had A Tail.” The video features the same creepy, dark art courtesy of Boneface and animation from Liam Braizer. In a very Deathproof-esque (with what seems like a Kurt Russell bobble head on the dash) clip, the video features a masked assailant (no spoilers), who goes on a bit of a rampage in their vintage muscle car. “If I Had A Tail” is a cut off of QOTSA’s upcoming album …Like Clockwork, which is set to drop June 4th via their new label home Matador.